Professional Forecasters survey shows a substantial improvement in economic growth and employment, consistent with the ECB’s own assessment.The ECB will be pleased by its latest Survey of Professional Forecasters (SPF). The headlines are unambiguously positive, fuelled by the uninterrupted improvement in economic data, with expectations of GDP growth and HICP inflation revised higher for the next couple of years, sometimes substantially. Euro area GDP is now expected to expand by 2.3% in 2018, 0.4 percentage point higher than three months ago. The unemployment rate is projected to fall to 7.5% over the longer-term, 0.4pp below the previous SPF. The details of the survey look even more encouraging. First, the distribution of probability has improved in most cases, including for longer-term inflation expectations which on average remained stable at around 1.9%, as tail risks receded. For instance, the probability of negative inflation in five years from now fell to 1.4%. Meanwhile the probability of ‘low-flation’ (inflation stuck between 0% and 1.5% for five years) fell to a four-year low of 27%. The report also provided some qualitative explanation for the rise in inflation expectations, linked to the labour market reacting to stronger growth with a delay, underpinning the ECB’s cautiously positive assessment of the Phillips curve. Using the methodology described in a recent ECB working paper, we find some evidence of a slightly better anchoring of inflation expectations. 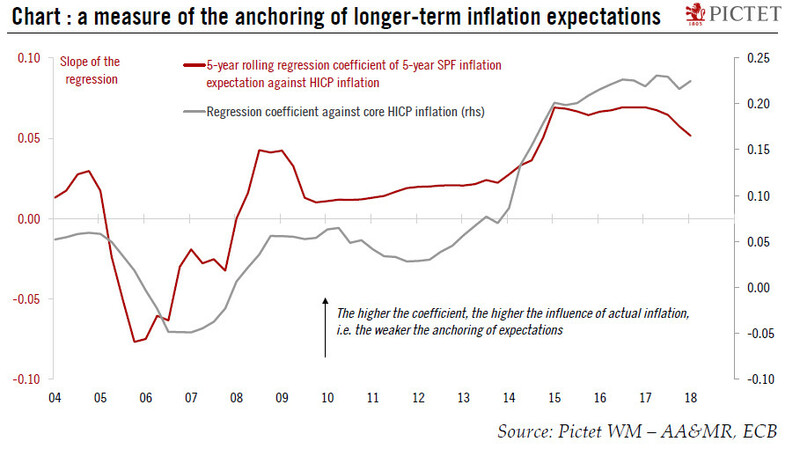 The correlation between longer-term SPF expectations and actual HICP inflation, which would be close to zero under the assumption of perfectly anchored expectations, has fallen to its lowest level since 2014. However, the model suggests that expectations remain too sensitive to euro core inflation, also known as a form of hysteresis, hence justifying the ECB’s prudence. ← Crédit Agricole Brie Picardie, baisse du dividende, quand l’incompétence et le mépris pour les porteurs se conjuguent!